The Nellie Tayloe Ross Papers: Making History (And Teaching It, Too)! Hi! My name is Jessica Griess and I just finished my junior year as a history undergraduate student. This past semester, I took an Archival Research Methods class at the American Heritage Center. The class allowed my classmates and I to work with collections at the archives for our assignments. In class, we use the materials found in the archives to compose papers and explore the various points of view of those present as history occurred. Over the past few months I have learned and been instructed on how collections are put together and how to work with primary sources. As a final project for the class, each student selected a collection to work with and worked with that collection to write a research paper based on that collection. I chose to work with the Nellie Tayloe Ross Papers. As with most primary sources, I have found this collection to be a fascinating one. Nellie Tayloe Ross was born in 1876 in St. Joseph Missouri and later moved to Cheyenne Wyoming with her husband. Nellie Ross was a devoted housewife and mother. In 1924 she became the first woman governor in the United States of America. She was elected governor after the death of her husband, Governor William Bradford Ross, three weeks before election day. Although she lost her bid for reelection in 1926, Mrs. Ross’s political career continued. After working with the Democratic National Committee and performing on a lecture circuit, President Franklin D. Roosevelt appointed her as the Director of the U. S. Mint in 1933. Mrs. Ross worked as Director until she retired in 1953. When she turned 100 in 1976, Governor Ed Hershler declared November 29th of that year Nellie Tayloe Ross Day. 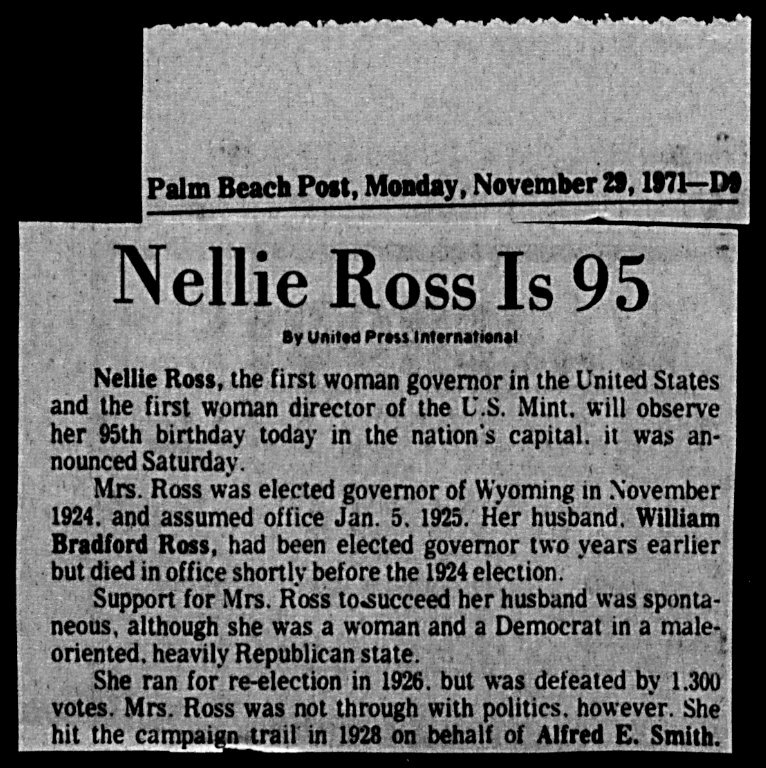 Nellie Ross passed away at the ripe old age of 101 in 1977 and Governor Hershler gave her eulogy. The collection includes documents from throughout Mrs. Ross’ long life. These documents include pictures, letters, newspaper clippings, scrapbooks, financial records, speeches, and diaries. Family trees and Mrs. Ross’ funeral program are also present in the collection. 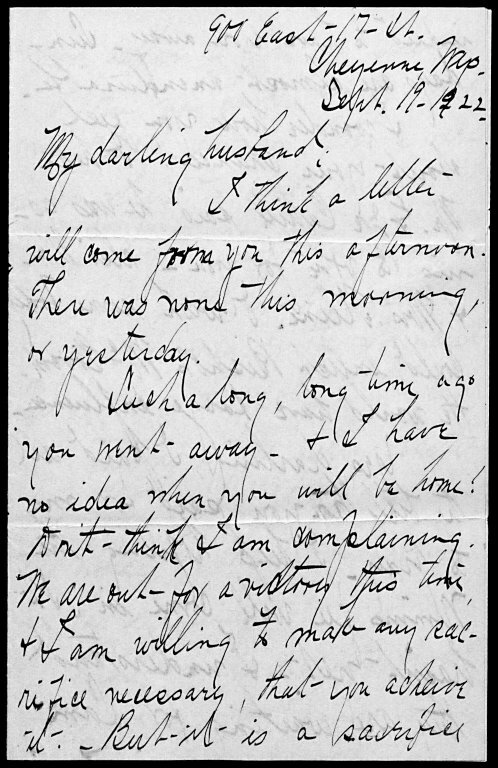 First page from a letter from Nellie Tayloe Ross to her husband William Bradford Ross, Sept. 19, 1922. Nellie Tayloe Ross papers, Collection #948, Box 1, Folder 1. UW American Heritage Center. There were times that I became completely caught up learning about Nellie Ross’s travels around the world and her close relationship with her kids and grandkids. Hours have gone by while I was so absorbed in the collection that it seems only minutes have passed. The Nellie Tayloe Ross Collection provides a detailed look into the life of this amazing and history making woman, and a brief look into the Wyoming politics of the early 1900s. This entry was posted in Student projects, undergraduate students, women's history, Wyoming history and tagged Archival Methods Course, Nellie Tayloe Ross, primary source resource, undergraduate students. Bookmark the permalink.